Cooking a delectable meal doesn’t have to be rocket science, but the 1800-watt Cinder Sensing Cooker does draw upon several techniques traditionally used in spacecraft design. That’s a bit of a hyperbole from its developer, but we’ll gladly excuse extravagant descriptors if Cinder can deliver on its promise of no-fuss restaurant-quality meals at home. 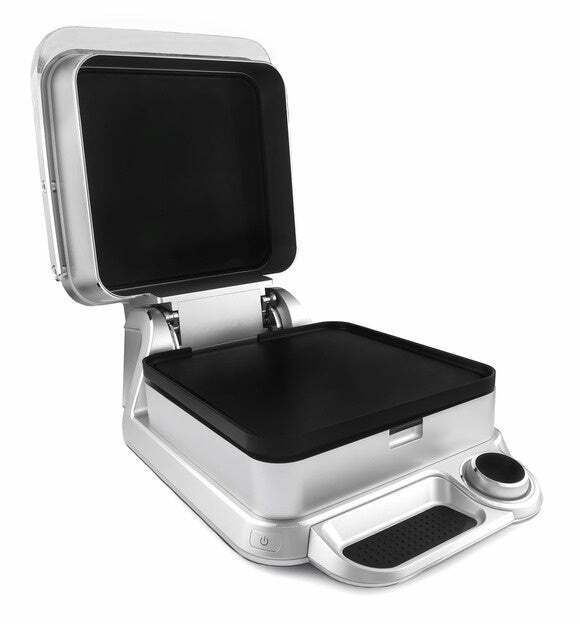 Cinder bears some resemblance to a George Foreman grill or any number of knockoffs, though it has more in common with sous vide machines like GE’s Paragon induction cooktop we looked at last month. The pitch is that by using precise temperatures, it’s next to impossible to overcook or undercook meats, vegetables, and other foods. It’s also capable of searing a perfectly cooked steak, which isn’t something you can do with a sous vide machine. While Cinder was designed for daily use, the best results come from using the accompanying iOS app for more complex meals that you might otherwise be reluctant to try. Connecting to Cinder via Wi-Fi or Bluetooth and using the app, you can select the type of food you’re attempting to cook, be it a flaky, seared salmon or a New York Strip steak. How do you like your steaks prepared? Pick an image and the Cinder will cook it to that degree. 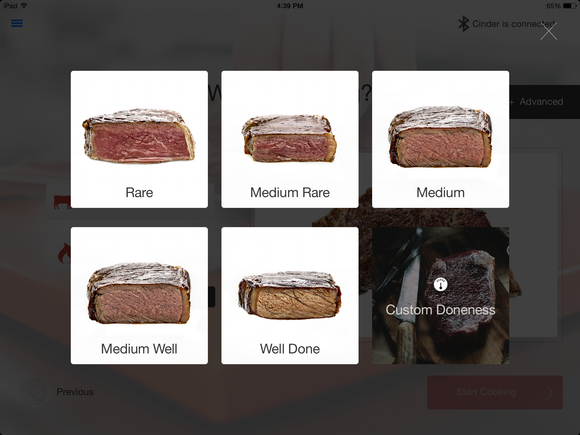 The app will show pictures of the food cooked to varying degrees, and all you need do is pick out which one looks tastiest. Point to the dark pink steak, for example, and Cinder will begin cooking up a medium-rare strip of meat that’s 130F at serving. Rather than take a one-size-fits-all approach like dumb ovens do, Cinder uses a series of smart sensors to adjust the temperature based on the cooking profile of each item. This means your medium-rare slice of cow will be cooked from edge to edge rather than overdone in one section and undercooked on another. You can also tinker on the fly to, say, add or a crisp to a cheesy crust. The best part for busy cooks is you can leave Cinder unattended. If you get caught up in a project that’s taking longer than you expected, the smart cooker will hold your meal at the precise temperature you set for up to two hours. And you can still add a sear, which only takes 45 seconds for a steak. The Cinder's aluminum sear plates can be removed and cleaned in the dishwasher. At 18 inches long by 12 inches wide and 5 inches tall, Cinder won’t dominate your countertop. The two aluminum non-stock cooking plates and drip pan are also dishwasher safe, so cleanup is supposedly a cinch as well. Why this matters: The number of smart home appliances designed for the kitchen is growing at a fast rate. 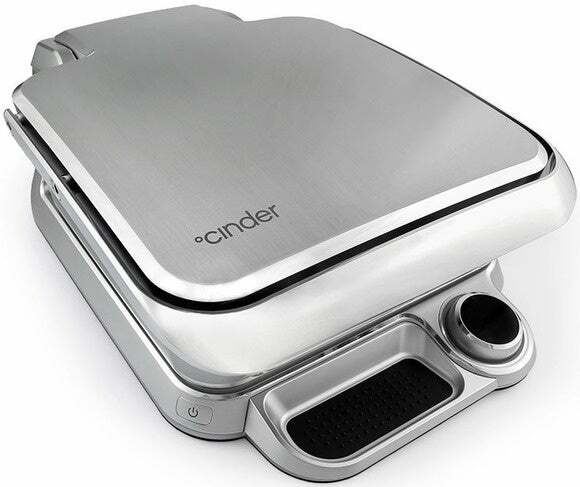 Cinder is yet another option for skipping the unhealthy convenience of fast food for a better tasting home-cooked meal. These devices don’t come cheap, though. The Cinder Sensing Cooker is available now to pre-order for $499 on Cinder’s website; equally hard to swallow is the fact that it won’t ship until early next year. You’re essentially gambling on there not being a lower-cost alternative between now and then.